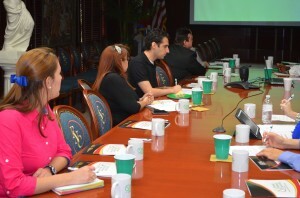 On Wednesday, June 12, 2013, Florida National University (FNU) held an MBA Orientation at the University’s Hialeah Campus. Mrs. Caridad Hernandez, VP of Academic Affairs, opened the session by welcoming the invited guests and introducing the MBA program’s faculty. Dr. James Bullen, FNU’s Division Head of Business and Economics, provided a brief history of how FNU’s MBA program was developed. During his presentation, Dr. Bullen stressed how an MBA can help open the doors for people wishing to advance their careers in any field. Following Dr. Bullen’s presentation, Dr. Ernesto Gonzalez, Department Head for Business and Economics, provided the attendees with an overview of FNU’s MBA program, pre-requisites and curriculum. In addition, Dr. Gonzalez discussed the Hybrid courses offered at FNU which is a combination of in-classroom and online instructions. He mentioned that FNU’s Executive MBA program can be completed in 12 months, but it does require a strong commitment on the part of the student. After Dr. Gonzalez’s overview of the program, Mr. Guy Michaud, an FNU MBA student, shared his experiences about the program. As a working professional, Mr. Michaud was able to help his organization solve an issue by referring to one of the case studies he had worked on during one of his MBA classes. 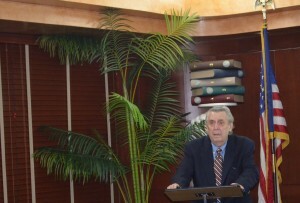 Mr. Michaud closed his presentation by mentioning that FNU’s MBA program requires time and self-discipline. The orientation concluded with a question and answer session and a chance for the guests and faculty to meet and discuss the program over refreshments. 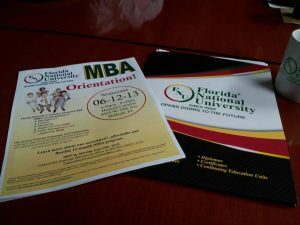 If you are interested in Florida National University’s MBA program, please contact the Office of Graduate Admissions at 305-821-3333 extension 1016.